Greeting cards are the most effective way of telling someone that you care for him or her. So, this New Year, send decorative greeting cards beautified with quotes for your loved ones and make them feel special. A New Year is one of the most-celebrated holidays that comes once a year. Different people from different countries celebrate the beginning of a beautiful New Year with utmost enthusiasm. People host New Year party or get-together, eat delicious food, and exchange New Year greetings with their loved ones. 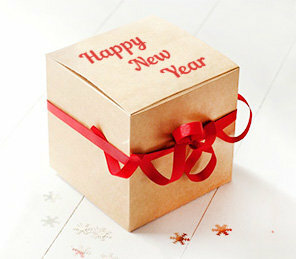 People also exchange New Year gifts with their family, friends, and relatives. Some of the popular New Year gifts that people buy are cakes, flowers, and greeting cards. Well, although cakes and flowers can perish, greeting cards can be treasured forever. So, if you are looking for the most thoughtful New Year gifts for your loved ones, you are at the right place. FlowerAura brings to you a creative range of New Year greeting cards online that are sure to express your deepest emotions for your loved ones in a beautiful manner. Yes, in this world full of technological advancements, greeting cards are still considered as the most effective way of letting someone know that you really adore him or her. So, sending a Happy New Year greeting card to all of your loved ones will tell them that your New Year is incomplete without their presence. A greeting card can express all your sentiments of joy, thanks, love, and admiration. It allows you to leave an everlasting impression in someone’s heart. Plus, a greeting card can be given to anyone regardless of the age and gender of the recipient. So, on New Year, if you want thank some people for making your life happy and bright, go ahead to buy some decorative New Year greeting cards online from us just within a few clicks. Whether you are looking for New Year gifts for him or her or mother or husband or wife or boyfriend or girlfriend, our range of creative greeting cards for New Year is sure to touch the right chord of your loved ones. We have greeting cards with beautiful quotes digitally printed inside and personalized greeting cards. Now, you can order a New Year greeting card online from the comfort of your home in a hassle-free way from our online gift shop. Sending greeting cards allows you to express your love, care, and affection for your family, friends, customers, clients and employees. So, no matter how far do you live away from your loved ones, you can now send them a New Year greeting card online via our online delivery. For example, if you stay miles apart from your girlfriend and it’s not feasible for you to visit her on New Year then, you can send New Year gifts for her from us and get it delivered to her doorstep on the same day. This is how you can send a New Year gift online from us and wish your loved ones a very Happy New Year. When it comes to our delivery services then, let us assure you that we provide instant delivery across India. Once your order gets confirmed with us, our delivery team start doing their work of delivering the gift to the recipient’s doorstep at the correct time. So, this New Year gift a New Year greeting card to your special ones from FlowerAura. You can also surprise them by sending greeting cards online to their doorstep on the same day or even at midnight. Yes, we ensure same day and midnight delivery services across India to build your bond stronger with your loved ones. So, if you want to experience a fast delivery service along with a free shipping benefit, start buying some amazing New Year greeting cards for your loved ones from our online gift store.